While summer weekends have tended towards the “world-bestriding, all-smothering behemoth” model, the classic strategy for these weekends is the “mutually counter-programmed medium busters” grouping, a kind of which we get coming up. Three widely targeted films, two of which with solid box office potential, try to build back up the roster after a couple of mega films cleared out the bench in the last few weeks. A surprise hit in early summer 2014, Neighbors was the latest in the vanguard of R-rated comedies, earning just over $150 million on the strength of a feud between Seth Rogen and Zac Efron, as well as the stealth comedic genius of Rose Byrne. In that film, Rogen and Efron engaged in an epic war of pranks and passive-agressive hostility when Efron's fraternity moved next door to Rogen and Byrne and their new baby. What could have been a shallow comedy actually had some surprising depth, as it tackled notions of maturity and male-bonding and the slow realization that you're not as cool as you used to be... and it had weed jokes. Tons and tons of weed jokes. Neighbors 2 sees Efron and Byrne wanting to sell their home and on their way ... until the hosue next door becomes a sorority, led by stoner party girl Chloe Grace Moretz, and who is if anything more determined to be disruptive than Efron in the first film. It's a great concept to tackle, as we've seen an increased cultural acceptance of “bad girl” behavior that goes hand in hand in with even less respect for boundaries. Facing an onslaught of non-stop, uncontrollable party girls, Rogen calls back in Efron for help in an ultimate prank war to secure the most yuppie of victories, the protection of property values, while Moretz just fights to have a little fun after a miserable experience in high school. While not as fresh an idea as when it appeared in Neighbors, it's a solid take for a sequel and will help the movie fight the notion that it's entirely unnecessary. While it's an outside chance to match the $49 million of the first film's opening weekend, solid ads and “it's better than you'd think” reviews give it a good chance to hit around $45 million. 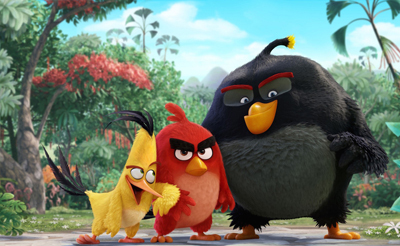 Speaking of “unnecessary”, we have The Angry Birds Movie, based on the hottest mobile gaming app of 2009 and which you got bored of some time in early 2010. While the game always did have a modicum of story to it (birds vs egg-stealing pigs), it takes that threadbare idea and expands it to feature format by investing the birds with caricatures and filling out the roster with a rogue's gallery of new birds that we're supposed to pretend have a back story we can care about.